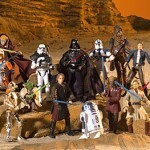 Hasbro has launched a free mailaway program for Star Wars Saga Legends figures. Just buy one of the qualifying Star Wars products between January 25, 2010 and March 20, 2010. Then send in the original store receipt with the UPC code from the toy (the code can be handwritten on the receipt) and the completed order form for three (3) free Saga Legends figures. Submissions must be postmarked by April 3rd, 2010. Click on the headline for all the details! Star Wars Captain Rex Electronic Command Helmet. Allow 8-10 weeks for delivery. The figures received will be based on availability and requests for specific figures will not be honored. All submissions must be postmarked by April 3rd, 2010 and received by April 10th, 2010. The purchase receipt must be original - no photocopies. Only valid for US residents and void where prohibited by law. Click here for the full legal copy, if you're interested. Ha! That just means no one wants to buy those items. Then they give you 3 free figures no one wants!